With Youth Homeless Awareness month coming to an end I want to close it out with two stories from homeless teen moms who found help, shelter and hope at Covenant House.
" I was homeless, I didn't have a job and didn't know what career path I wanted to do or where I was going. Covenant House has been a major successful avenue to me and my daughter." I came to Covenant House pregnant, homeless and without clothing or direction. Thanks to Covenant House I now have my CNA, security license, OSHA ten certificate and on Thursday I begin working towards my phlebotomy license. My daughter and I have a room, a bed, food, clothes and a family. Through Covenant House I've gotten my life back on track, I'm learning how to save and learning a lot about myself. I've learned that I truly have a passion for helping people reach their full potential. I've been "there" before, I want to be what Covenant House was to me for someone else. That is amazing! Could you share your story of homelessness with us? have my child and leave or find a way to pay for an abortion and stay. I choose to get an abortion, which my aunt paid for. After getting my abortion my relationship with my family didn't get any better, the environment was just very negative. However, I was able to earn my G.E.D. After dealing with constant put downs and rude comments I ran away. When I came back three days later she wouldn't even let me back in the house. She paid for a train ticket for me to go live with my aunt in Pennsylvania. I lived with my aunt for three months and was putting myself through college when my aunt kicked me out. Oh my goodness, that's crazy! So what did you do after she kicked you out? After living in and out of homes and public places I got a job with Amazon.com and thats how I got my first apartment. However, the work was only temporary so when the checks stopped coming in the apartment was gone too. At that point I was homeless again, didn't know I was pregnant and on my way to New York City. I moved in with another aunt and once she found out I was pregnant she insisted that I get on welfare and have the state take care of my child. I refused, so she kicked me out. After that I moved in with a friend but couldn't stay long term. What were your options at this point? I mean you're homeless, pregnant and in one of the toughest cities to survive in. I decided I had to go to a shelter. However, Path (a NYC based homeless/ shelter program) found me ineligible to go into a shelter. They gave me an ultimatum either I go back to my aunts house, which I wasn't allowed there, live on the street or go to The Covenant House. I came to Covenant House in October 31st, 2009. I was here for a month and they helped me decide what to do in order to be better prepared for when my daughter was born. They helped me get my security license, I left (because my 30 days were up) and went back to Path and was found eligible. At this time I had my daughter, had a small studio type temporary housing but my mother was in the city. Her and everyone else telling me Path wasn't any good led me to leaving. The combination of people telling me that the program I was in was no good and the sound of wonderful promises can do that to you. I didn't move back to Georgia with my mom because that didn't work out," so I was back at my friend's house. I was depressed and at a lost. The environment at my friend's house was not safe and I couldn't have that around me or my daughter. I remembered that Covenant House had a CNA program and how much they helped me out before so I came back. Wow. You have truly come a long ways! How did you survive emotionally ? I remind myself although I have been through somethings my story in reality is not that bad. I find inspiration and positivity in everything. Being positive and surrounding yourself with positive people is the ONLY way to be. Diamond is AMAZING! While listening to her heart wrenching story all I saw in front of me was a strong, POSITIVE, determined young mother and women. I would like to point out that Diamond is ONLY 21 years old and has already defied so many odds. I am confident that she is and will be the best role model for her and her daughter. 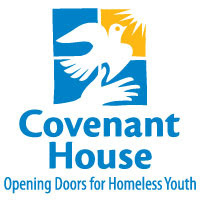 If you are a pregnant and homeless or know some one who is one or the other PLEASE refer them to Covenant House!